Here is one of the most interesting data sets I’ve seen in some time. 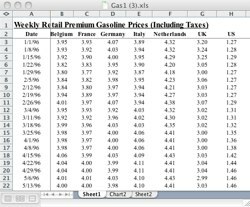 From the U.S. Department of Energy, this Excel file lists the price of premium fuel for six European countries and the U.S. for every week going back to January 1996. When visualized, the growing price is gasoline is illustrated, but not quite as impressively as the difference between what Europeans play for petro and what we pay. Anyone know why that is?